Artist Presale: Tuesday, March 26, 2019 at 1:00 p.m. – Thursday, March 28, 2019 at 10:00 p.m. 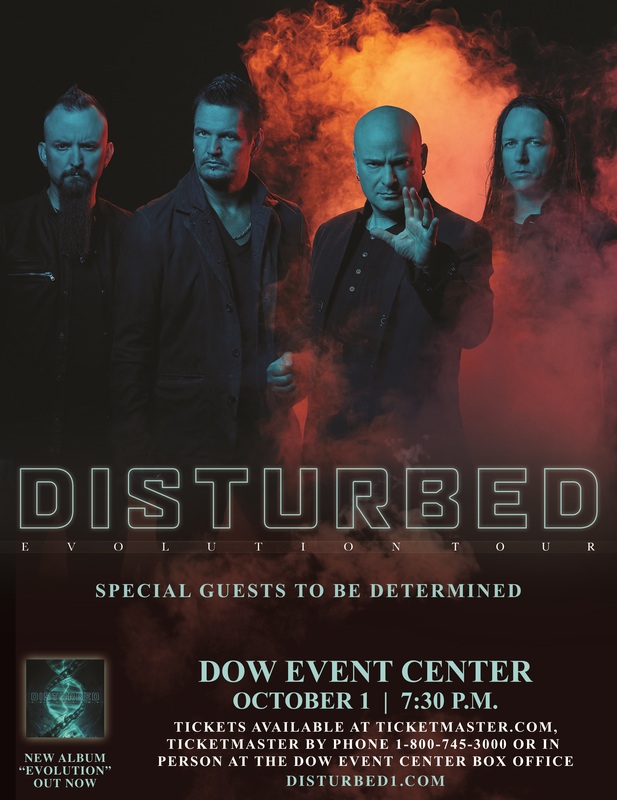 The Artist Presale is only available only to members of Disturbed’s email list. To sign up, please visit https://bit.ly/2CFLVC1. The Artist Presale is available online only at Ticketmaster.com with the Artist Presale code. Venue Presale: Thursday, March 28, 2019 at 10:00 a.m. – 10:00 p.m.
Venue presale tickets will be available online only at Ticketmaster.com with the venue presale code. The venue presale code will be released via email to all venue subscribers at approximately 10:00 a.m. on Thursday, March 28th. If you do not subscribe to The Dow Event Center email newsletter and would like to receive the venue presale code, please sign up for our emails at https://bit.ly/2LC76Y2 by Wednesday, March 27th at 11:59 p.m.
On Sale: Friday, March 29, 2019 at 10:00 a.m.